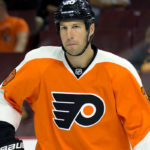 General manager Chuck Fletcher, addressing the media Monday, said that captain Claude Giroux was virtually the Flyers’ only untouchable, that whether he signs or deals dependable right winger Wayne Simmonds will become clear in a few weeks, and that he hopes to add a player before the Feb. 25 trade deadline who can help them in the long term. “We could both buy and sell,” he said in a wide-ranging interview after the Flyers’ morning skate at their practice facility in Voorhees. Entering Monday night’s matchup against visiting Winnipeg, the Flyers have won three straight but are still 14 points out of a playoff spot with 34 games remaining. Fletcher, named the GM on Dec. 3, acknowledged the playoffs are a long shot but said he is still hopeful. Fletcher said the Flyers “have good players, [but] we haven’t been a good team. We haven’t defended very well. Our specialty teams have been atrocious, at least in terms of what the numbers say.